Patterns... Eek. I've not even got my wool yet. It'll be plain, if I get the hang of it. Yes yes yes to plain squares too! Going to attempt some sort of pattern I think...be brave...be brave. Yarn arrived yesterday. OMG - I thought it was going to be a strong fuchsia but it's virtually day-glo. 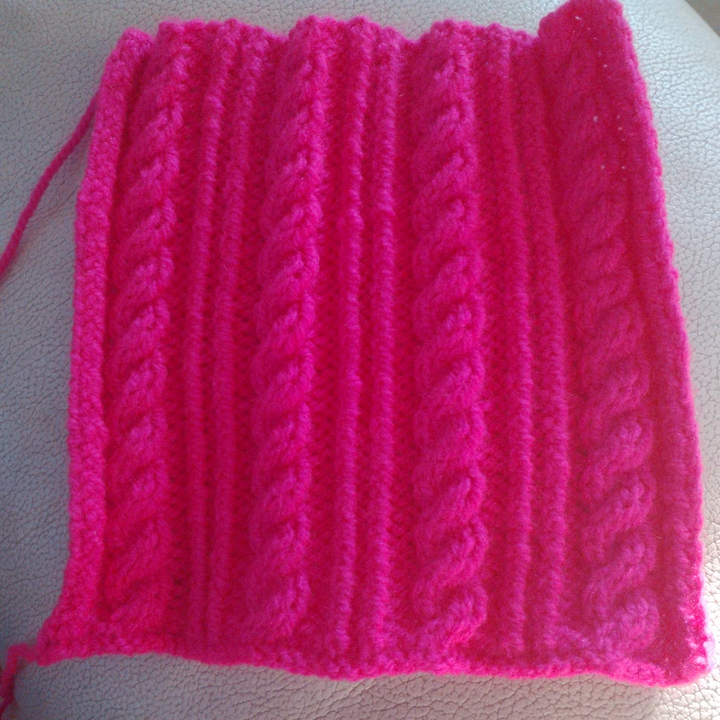 Have done a couple of cable square so far. Hope to manage a couple more today. H can you send me your address..? I have 5 squares so far but there's no stopping me and I want to finish the wool so I will send as many as I make. Also H you remember that chart you sent, that is what helped me understand it in the end. Can you send me something similar for that design above - I can see it's similar but not the same. Also the circular ones that Purps makes? Or a link to a chart? Only managed one yesterday. Driving home from Liverpool today but will try to do 1 more. Always envied the speed at which crochet can be done - all that empty space with no stitches in it! Can I have your address too please H.
Anyone else like to share? 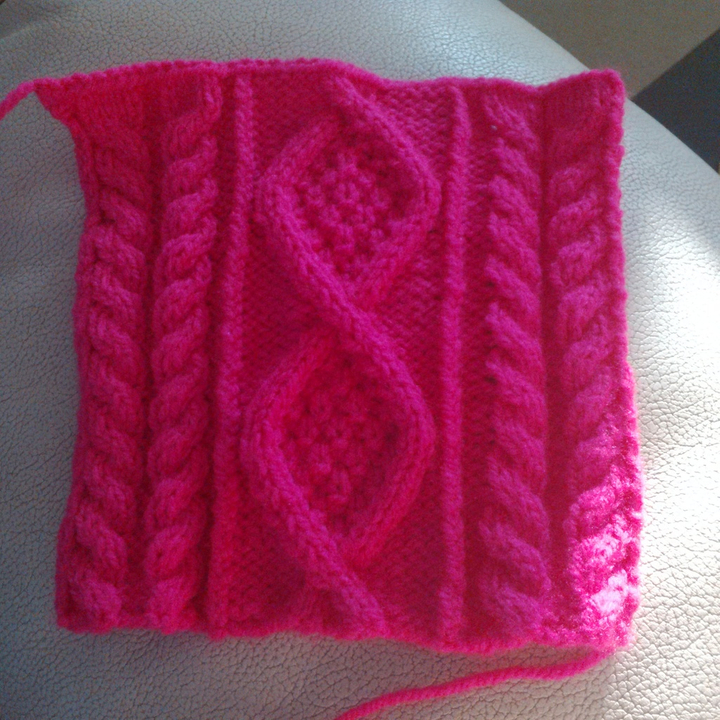 I've found that, for cable patterns, 45 stitches is about right for 6". My first one was a bit narrow and H is going to have to stretch it a bit. Ms - your knitting is so neat! I can't get my tension right at all with knitting. Very impressive squares ms. I've been so impressed at the hidden talents and determination of everyone involved in this blanket. Feel a bit sick waiting for mj's update. Wow ms they are beautiful! My squares aren't really square. 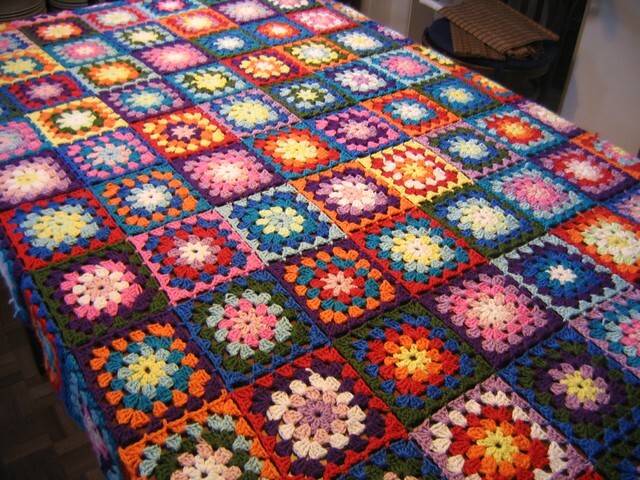 And the other squares collected from the Beamish meet are so gorgeous! Mine are the ugly ducklings. But I'll send them anyway, so that they make all the other squares look more like swans. I wouldn't worry Sarah. Pin them out to 6" square on your ironing board, hover over them with your iron on the lowest heat setting that will still produce steam and steam for just a few seconds. The wool relaxes into the shape/size you pin it to. H posted this on FB somewhere. My dodgy and curled ones looked much better after this. If not when H sews them together they will still look fabulous.